This was a long journey kind of book. This is an LDS book about learning and growing closer to God. It took me a long time to finish and felt more like schooling. I loved it and learned so much. 4.5 starsAmazing insights by Ulrich into broadening one's mind about understanding the rituals and ordinances practiced in the Latter-day Saint temple. As a psychologist, Ulrich gives an account of how the temple practices and ordinances can be both a deeply personal and spiritual experience, if we let them be. Even though she is a psychologist (and while she does give examples of her patients growth) she often gives examples of her own, which is humanizing and helps you relate to her. She also asserts that the temple ordinances are catalysts for great change in one's mindset, spiritual and temporal growth and offers practial steps at the end of each chapter to help the reader start on the road to achieve such changes. I rented this book but will have to buy it to start marking it up and start the exercises Ulrich provided at the end of each chapter. I hope to keep coming back to the book as I learn and grow.My one and only criticism of the book is that I felt some parts overly repetitive, yet that pales in comparison to what can be gained by reading this book. This is one of the few books I give a wholehearted 5 stars to. I have read the whole thing through once and several chapters a few times each. I am currently rereading it slowly and doing the journaling exercises.Wendy Ulrich has a unique and insightful way of looking at the temple and its symbols, ceremonies, and meanings. It truly is the best book I've read on the topic. The interesting thing is, I don't know that everyone would "get" this book. She takes a very different approach than you will get from a general authority.Wendy Ulrich uses her personal journey and insights and her counselor's toolkit to help the reader ask himself the questions that will enhance individual understanding. In order to avoid speaking of specifics of temple ceremonies inappropriately, she uses different techniques, like dream symbology, to help the reader think through the temple experience and connect the dots for himself, as it were. I can completely understand how that might be confusing or off-putting to a few readers. But it really worked for me. I found that her writing is rich and multi-layered, and although I am a fast reader I have to slow way down to read this. 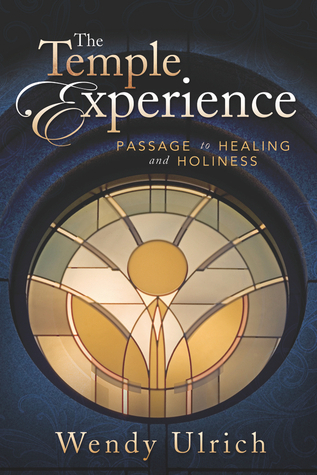 I especially appreciated Ulrich's insights into understanding the temple as a house of healing, including a chapter on healing from abuse. I feel as I read that I am sitting with an older and wiser friend and confidant who gently guides my perspective to examine things in a new way, under a new lens. This book has been a wonderful tool for me that continues to inform my personal temple worship. I am very disappointed with this book. The real name should be "How Psychology Pertains to the Temple"! I didn't learn anything new about the temple experience, just how to psychoanalyze everything! If you are looking for a shrink, this book might be for you. If you really want to improve yourself and gain 'further light and knowledge' I would recommend 'The Second Comforter' by Denver C. Snuffer Jr, or 'The Triumph of Zion: Our Personal Quest for the New Jerusalem' by John M. Pontius. In either book you will learn more about the temple than in this book. This brand new book by my dear friend, Wendy Ulrich, is amazing in its breadth, scope and insight. Wendy has written this book over the past 20 years and I - and many others - have shared so many conversations that she crystallizes into applications of meaningful temple metaphors. This book will absolutely enrich your experience of the temple...and give you encouragement and insight that will enrich your life. I cannot recommend it highly enough! Take your time with it and enjoy and benefit from every single page! This is a remarkable book. It insightfully blends principles of psychology, personal healing, and spirituality. The ideas will help readers heal and find peace with the Divine. It introduces novices to the principles of temple worship and it gives devotees more food for thought. It is a book that can help you better make sense of the difficulties which inevitably arise. Wendy is a great speaker, but an even better writer. Lots of good insights and suggestions not just for spiritual growth, but also for emotional and physical health. She talks a lot about healthy relationships. All of it is related to the temple experience in interesting ways. So many insights. I know this is going to make a difference in my Temple experiences. It took me months to read this book because it seemed like every paragraph included a thought to savor, and I didn't want to rush past anything. I couldn't mark the great passages because I would have had to mark almost everything. This is the best book about one's individual temple experience I have read, and was so thought-provoking, with nothing inappropriate concerning this sacred topic. I will be reading it again soon to try to incorporate its ideas into my mind and spirit more thoroughly. Many thanks to the author for her excellent insights. This took me almost a year to read and prayerfully study. It has made a life time impact on how I view the temple and my relationship to the temple. Whew! Will have to re-read this many times to really understand it. She is a deep thinker- but I enjoy her thoughts very much. I came to this book from the healing angle. It called out to me as I walked by it in the bookstore. I'm so glad I trusted my gut (or the Spirit) on this purchase. I have a feeling I will revisit it and the practical exercises from time to time. I can understand the low ratings and disappointment from readers who came to this book wanting to learn more about the temple. It really isn't about the temple teachings and deep symbology, but rather uses them as a framework for healing life's hurts through living the "temple experience" we call existence. The "healing practices" Ulrich includes at the end of each chapter are some of the best I have read in a book about psychological healing. Often they are not sufficient, but I found these very helpful. I appreciate the good footnotes and the helpful resources for further reading. One thing I did find surprising is how many of Ulrich's sources are old. Most are from the late 1980s to mid 1990s with a few very early 2000s (this book was published 2012). The most recent were Brene Brown's early books. I'm not sure if this is because Ulrich has not kept up with the accessible literature in her field, the literature she chose has had time to be vetted and proven, or there truly hasn't been anything better published in the intervening 15 years. I'm a big fan of Wendy Ulrich - have followed her work since hearing an impressive FAIR talk. I love her honesty and her owning up to the complexity of faith. For a number of reasons (including spiritual and ecclesiastical abuse experienced by family members and loved ones) I've not returned to the temple in 20 years. Last few years I've felt a yearning to return, fueled by my own evolving faith and personal needs, but also my reading of Margaret Barker, a Methodist researcher with amazing insights about temple theology.I read Wendy's temple book as devotional reading with my wife. We'd curl up together and take turns reading paragraphs. Some points were very moving for us. By book's end I had completed a decision process to return to the temple. My recommend is now all signed and ready - we're just looking now for the time to get down there!Thank you Wendy for your thoughtful and steady faith, and for looking deeply at things that so many of us take for granted! I could not finish this book which is rare for me. For someone with a PHD her research was sloppy. Tons of claims and no evidence to support it not even empirical observations. Some of the connections were Bizarre and made no sense. For example, God creating animals has something to do with interpreting dreams? ?I asked myself several times throughout the book what in the world does this have to do with the temple and healing. I feel like the idea and this book had a lot of potential and maybe needed a stronger editor to streamline it a little bit. A friend recommended this book to me. She had told me it is about symbolism in the temple. Not sure that is really what it's about, but I'm going to read it anyhow... I'll let ya know what I think when I'm done! I just finished it and I liked it. It made me think and took a few thoughts I've already had and put them into words. Some interesting points of view. I didn't agree with all of it, but enough that it was a worthwhile read. This book provided me with many great insights into how the temple relates to our everyday lives. Wendy Ulrich helps us understand the symbolism of the temple better than any author that I have read. She both broadened and deepened my understanding of the temple. I now look forward to going back to the temple with new eyes and enjoying my experience more than ever! I haven't finished this yet. I've skipped around in it, not read it straight through. But it has been worthwhile and thought provoking. I value books and articles that help me consider the temple experience in meaningful ways. This book does that for me. One of the most intriguing books I have ever read... I love her insights, when I finish it I will start it over even though many of the chapters I have already read twice! Truly inspirational! Would love to do a book club on this. Not what I expected. It was far to philosophical and dug to deep into personal introspection. That might be what some people want, but it didn't do much for me. I tried to finish the book, but finally gave up. I really like her other book, Weakness is Not Sin. I have heard her speak a few times and I think she is great. This book though, was really hard to get through. It was too abstract for me. I found my mind wandering often. I gave up reading it. I liked the insights in this book. She looks at the temple from a psychological/therapy point of view. She's not trying to give THE interpretation of the temple experience, but saying that it might help to look at it from this point of view at times. I liked it. Excellent, excellent book! One of my favorites!! This book is amazing. I absolutely loved it. So much insight. Very healing. Just read it - you'll be glad you did. So good. Saw Wendy at Education Week and we were able to reconnect while she signed my book. Best book I have read about the symbolism in the temple and how it relates to wholeness for all who participate.